I have been feverishly working on making Bronz Beads, charms, & components. Making components, instead of just jewelry has been VERY freeing, and I am feeling just lovely, or "beadiful" if you will. I am using them a lot in my own jewelry, but want to make enough to offer them for sale. I am offering some sneak peeks today, and stay tuned for another giveaway with some of my brand new products! I am also doing some polymer clay hearts, because they are just too fun to make! The rest of the polymer in this first photo was used to make molds for my bronz clay focals. And then here is a kiln load, right outta the fire. They are not even cleaned off yet. So, for feedback, tell me what your favorite form of artisan component is.....earrings, pendants & focals, charms, clasps, ect....................AND what shapes are you drawn to? As you may see, I go for circles everytime! 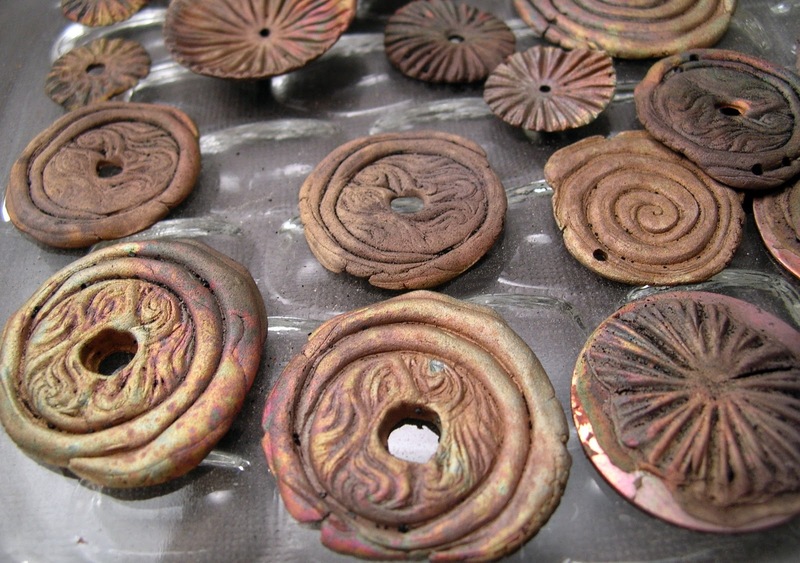 Love those bronze pieces! Hmmm, my favourite component . . . . I think charms/dangles, and in either round, oval, or irregular but flowing shapes. WOW you HAVE been busy! Lovely things! Thanks guys! If you saw how backed up on wash I am here, you would know how much time it took to make them;) But its all good. 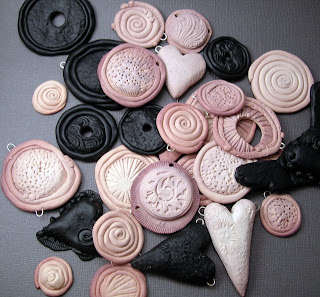 I made some pretty chunky focal stuff for necklaces and bracelets, I think I will make some daintier charms next!!!! Those are great. Love the look. I'm usually drawn either to circles or ovals. Wonderful work! Charms... and different shapes are great.